These were God’s instructions to the nation of Israel regarding the poor who lived within the land. God obviously wanted those with more to help them. 1. We should not turn a blind eye (“harden your heart”) to their need. Interesting that God first confronts the inner attitude towards giving. How many times have you walked by a beggar on the street and not given them a few dollars because you were repulsed by their appearance or condition? Or maybe you heard of a need but because that person had some other issue or character flaw, your heart was immediately hardened to helping them. You didn’t even consider or pray about it. Count me guilty. 2. After dealing with the inner attitude, God gives us an action item – a command – open your hand and give to those in need. And how are we to give? Freely, of our own good will. No one should force us into giving. Generously, to sufficiently meet their need. No half-way giving. Cheerfully. It should not grieve our heart to do this act. 3. The blessings of God are upon those who choose to follow His command. The poor will always be with us. 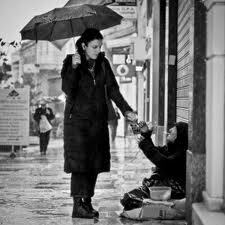 We need to be sensitive to their need and give generously to help them when we can. But I think there is something deeper here – an attitude that we need to overcome if we are going to have real success with our personal finances. I’ll cover that in my next post.